UC Berkeley Allows Police to Actually Protect Free Speech. The Difference is Clear. — Condition Yellow: Stay Alert. Stay Alive. Last night, prominent conservative speaker Ben Shapiro gave yet another rousing talk at UC Berkeley, despite multiple false starts and previous attempts from leftist administrators to shut down the event. This time, the focus is less about what Shapiro had to say and more about the protection of free speech. We're happy to report that the event was a smash success thanks to a police force unencumbered by stand-down orders and ridiculous restrictions in the name of political correctness. In the light of previous attempts by Antifa cowards to shut down other speakers on campus using violent tactics, UC Berkeley pulled out all the stops this time. Concrete barriers were erected, buildings were cordoned off and hundreds of police officers established a secure perimeter. Stand-down orders were not given this time — in fact, a 20-year-old ban on the use of pepper spray against violent protesters was lifted. Police Chief Andrew Greenwood promised “very strong, rapid arrests” if any demonstrators come carrying weapons or donning masks. The difference was clear. Police officers monitored the hundreds of protesters that turned out to decry Shapiro as a violent racist alt-right white supremacist (with zero evidence of course). Anyone covering their face was confronted and either removed or unmasked. Confronted by an unencumbered police force and with no masks to hide behind, leftist Antifa thugs couldn't attack without fear of repercussion. The entire evening remained largely peaceful because of this. Of course, leftist media sources are claiming that the woman merely had a 'medical emergency' and that 'Antifa was a no-show.' They were there, all right — they just weren't masked or in uniform. The face of the "tolerant" and "peaceful" left. Hannah Benjamin, 20, of Fremont, on suspicion of battery on an officer and carrying a banned weapon. Sarah Roark, 44, of San Francisco, suspicion of carrying a banned weapon. Kerem Celik, 18, of Saratoga, suspicion of disturbing the peace near Bancroft Way and Telegraph Ave.
Eddy Robinson, 44, of Oakland, was arrested near Dana Street and Durant Avenue on suspicion of carrying a banned weapon. 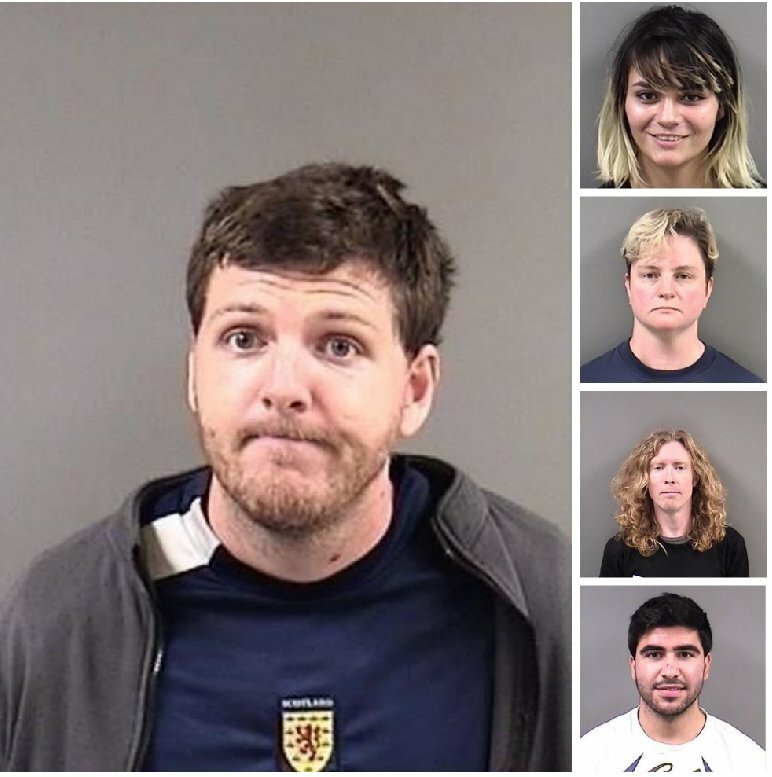 Michael Paul Sullivan, 29, of Hayward, was arrested near Bancroft Way and Telegraph Ave on suspicion of carrying a banned weapon. Others arrested include Noe Gonzalez Gudino, 24, of Richmond; Miguel Reyes, 21, of Colton; Jorge Cabanillas, 20, of Rialto; and Darin Bauer, 45, of Berkeley. The left clearly came out armed and ready to do violence against Shapiro's supporters. In a previous broadcast of the Ben Shapiro Show, Shapiro called for peace among those planning to attend his event and to allow the police to do their jobs. Indeed they did. Had the crowd around Southern been allowed to conceal their identities and carry weapons, there's little doubt she and other conservative supporters would've been seriously hurt. Berkeley police did an excellent job being proactive throughout the entire day. At times the rally erupted in a few shouting matches, but no major violence. Xochitl Johnson, 42, of Oakland, one of the Refuse Fascism organizers, said Shapiro and other speakers make students rethink their beliefs — and “tamp down” their activism. Goodness, we wouldn't want students to rethink their beliefs, let alone think for themselves! Chalk up another victory for free speech. Correction: Berkeley Police has released new information regarding a woman that was allegedly pushed to the ground. We have corrected the article has been edited to reflect the change.